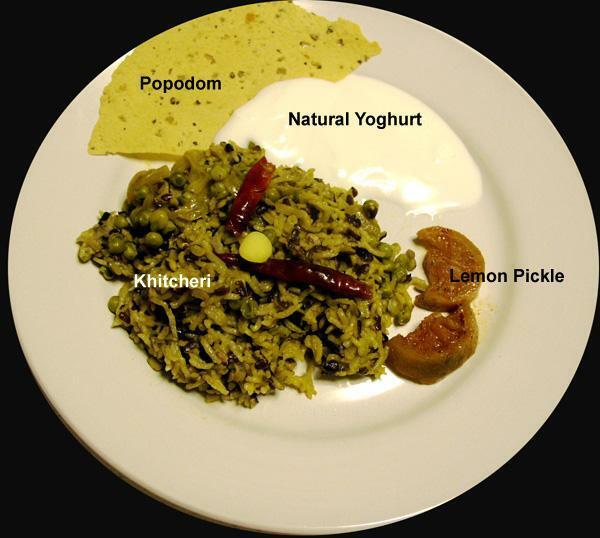 Khichri, also spelt as Khitchuri, Khichari Khicheri or Khichdi, is an easy dish to make. It is nutritious and a complete meal in itself. It is often made when the 'cook' is not in the mood to cook. In my parent's house, in India, it was often made on rainy or cloudy day. In my mind, whenever I make khitchri, a picture of clouds, a gentle cool breeze and singing peacocks comes to mind. We all loved it, served with creamy natural yoghurt, Mango Pickle, Green Mango Chutney, Sweet Mango Chutney and dry-roasted papads (popodoms in the West). We often ate it sitting on a swing on the verandah. 150 gm. moong/mung split green gram lentil) or urad/urd/urid dal or black gram lentil, with skin. Ordinary red lentil will also do. A pinch of asafoetida (hing) optional. It is good for digestion. 1/2 tsp. turmeric powder (optional). Turmeric is good for healing. 1 onion - peeled and sliced. Clean, wash and drain dal and rice together. Boil water in kettle or a separate pan. Heat oil in a pressure cooker or a pan with a tight lid. Add cumin seeds and asafoetida and wait until seeds sputter, not letting them burn. Add onions, if used, and fry until golden brown. If using any other vegetables, add here. Add rice-dal mix and stir fry for a couple of minutes. This will coat the rice and dal grains with oil. Add salt and turmeric and give it a quick stir. Add enough boiling water to cover the rice, and 1/2 inch above it (1 1/2 inch, if not using pressure cooker). Bring to a brisk boil, pressure cook for 2-3 whistles or pressures*. If cooking in a pan, cover and simmer gently on a low fire, until almost all water is absorbed and rice and dal are tender. *When the pressure builds up in a pressure cooker, the steam escapes with a hiss, letting the pressure down. This counts as one whistle or pressure. Pressure builds up again and the same thing happens again and again, until you switch the heat off. In India, people usually count the number of times this happens and call them pressures or whistle. If you find it difficult to follow, for green gram/moong dal, cook for 3-4 minutes under pressure. For black gram dal/urad/urid dal, cook for 5-6 minutes, because it takes a bit longer to cook. You can add a 1/4 tsp. of garam masala, along with salt and turmeric, at step 7. Experiment with adding other vegetables.